Translation industry is changing. 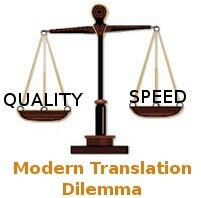 Various external and internal factors put a heavy pressure on traditional translation services. The best translation or no translation approach isn’t enough for the current translation demand. The fact that there aren’t enough professional translators to translate everything with the highest quality creates some space for new solutions. Before global online markets, there have traditionally been three options for potential translation buyers: no translation, poor translation and perfect translation. No translation meant that the original language was chosen to be suitable for everyone. Poor translation was created either by someone who knew the language a little bit or by a simple and expensive machine translator. The highest translation quality came from a local professional translator. These three options were basically the same for everyone. The quality was given: you’d get either perfect or poor translation or choose to have no translation at all. The capacity of good quality translation was limited by the local translators’ work hours. The tradeoff was often made between time and quality. Still it wasn’t a problem because there was a much smaller demand for translations. Since the online world has created global communication and competition, translation options have increased. The on-off quality switch has become a wide quality spectrum. For example, machine translation has been developed further, and its quality has improved a lot from the early days of automatic translation. Today, MT is quite usable in many situations, and there are several types of MT solutions (free, paid, customized etc.) for different quality needs. Globalization has created a market for a wide variety of translation services. The old translation quality standards don’t apply anymore. Customers don’t want to pay for the best quality when they only need good enough quality. The industry is slightly slow in digesting the changed demand. Technology is considered as competition although professional translation and MT are targeting totally different needs. 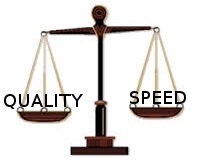 Speed is sometimes more crucial than highest quality. Global competition makes it possible to always find a suitable price based on desired delivery time and quality level. The amount of content has expanded dramatically. No one can translate it all. The content has to be prioritized for translation. The most important material will get a professional translation also in the future. The other content is translated with a bunch of other solutions, like machine translation or crowdsourcing. Translation customers are willing to pay for services and tools that meet these different quality needs. MT-Qualifier finds the good translations amongst raw machine translations. Your translation and post-editing process will become more efficient and faster. Learn more.